Water companies have been set the target of a 15% reduction in leakage, so we at Dootrix popped along to see if we could put together our machine learning minds with some of the best in the business to help solve the problem — No Pressure! Arriving at the five-day festival located at the picturesque Newcastle racecourse, we were invited to the all of the activities that were on offer before the hack began. Every need was catered for, from Smoothies stand, Indian head-massages to volleyball tournaments and drone flying. 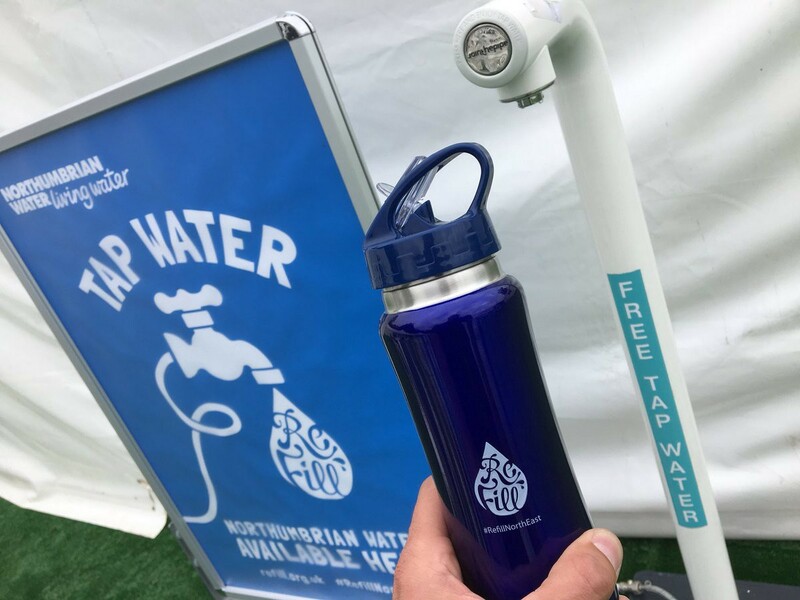 Even a free swag bag full of goodies, including a fancy new water bottle, preparing us for zero-waste approach! After exploring though and having fun, it was time to hack! The festival split into different hacks and design sprints, we chose to take part in the hack for water leakage. As we entered the room, you could feel the brain power at work from the data scientists, developers, engineers and designers from some of the biggest organisations around. Our team was made up of Paul Glenister, Mobile System’s Manager for Clancy Docwra, along with his data experts, Kyle and Josh. Our Dootrix team, comprising of myself, the product designer, our coding ninja Wayne Mcmanus and our Scrum master/tea boy, Alan Mardell. To complete the dream team, there was Mugdha Pathak from ebecs, and Simon Ayley from WRC. Day one consisted of learning everything we could from the likes of Dennis Dellow (Network Manager at NWG) and Michael Hull (Performance & Information Team Leader at NWG) to name a few. This allowed us to conduct a few user interviews and research into the types of insights that might be of use during their daily routines. As day one drew to a close, we decided that the best idea was to talk over our initial ideas with the help of a few 🍻 … you know to help get the creative juices flowing. Day two: With big data, comes big responsibility. As the sun rose on day two, we downed our coffees & festival smoothies to put the spring back in our step. Hydrated and focused for the day ahead, it was time to decide on our approach. Add to that, the insights and knowledge of Paul and his team. Our approach was to take the data set that had been supplied, showing the burst and leakage history and combine that with outside data sets, to see what environmental factors were at work during these times. Our theory and expert knowledge lead us to believe that by combining temperature, traffic and material data, there would be a strong a correlation that shows historically these factors together lead to a leak or burst. c) The vibrations of the traffic, combined with the brittle ground will cause pipe movement. Now just to prove it! So we started by accessing the open source data from the Met Office, which gave us accurate historical weather data. Allowing us to map the bursts to potential combining weather situations, i.e. very high or low temperatures. Next up we got talking to the team from Ordinance Survey 👋 They were gracious enough to lend us some of their traffic data. Allowing us to then overlay the hotspots in conjunction with the Met Office weather data. Now we had the data in place, Wayne and Mugdha fired up ML Studio and got to work on applying this theory to a training model for Machine learning in the hope it would be able to accurately predict the bursts of the future. We knew we were onto something, a powerful insight that could help workforces up and down the country be more proactive in their approach. But without the right presentation of the data, what use would it actually provide? We went back to our initial user cases based on the JTBD framework; these are the operation managers, they need to see how their entire network is evolving at any one time so they can effectively manage their workforce. 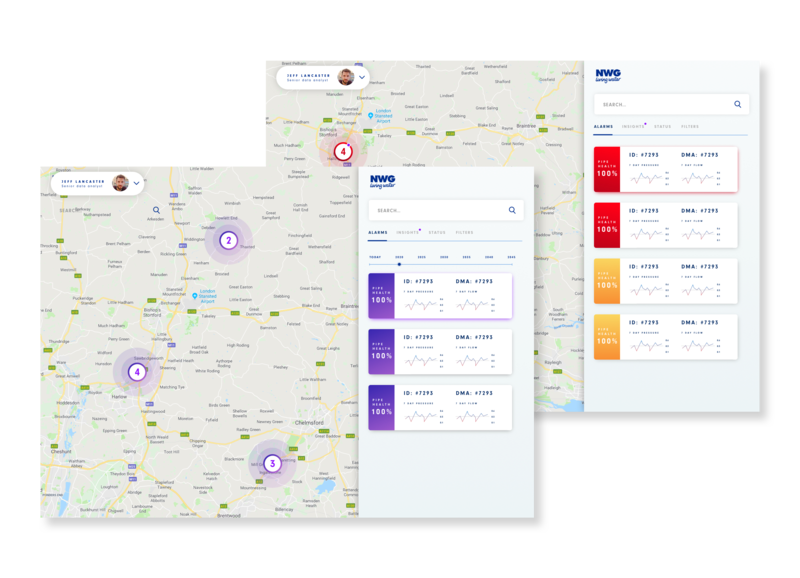 Our idea was to develop and prototype a mapping system that allowed the operations manager to see key points of their network, with a series of controls/tabs on the right. Two key objectives for the operations manager, firstly to see the current status of their network, is there an immediate burst that needs attention? And secondly, to have the ability to look forward in time with insights and see if there may be any future problems. The solution for showing the current status was to use a card system that was colour coded. Red for example showing the most serious alarms, followed by amber for less so. The colour coding also translated onto the map itself, to make it clear to the user where the hotspots were. This was followed by a separate tab for the insights. The insights tab had an extra component that allowed the user to change the timeframe in which they were viewing their network. Combining this with our Machine learning model allows the user to see how their network will evolve over time based on weather and traffic data. Our thinking was that with this insights planning, users can forward plan to target risk areas and stop leaks/bursts happening in the first place. Our next stage was to offer a deeper level of insight to the user, allowing them to see how the pressure and flowcharts have responded in conjunction with our other weather and traffic inputs. To achieve this we designed a quick reference overlay that would work on top of the map. The key screen being the insights panel, in which users have a date slider for that particular data point, to see how it will evolve over time. This in conjunction with the ability see any alerts that the machine learning has flagged on a day with potential very high or low temperatures. Again allowing them to pre-plan their workforce on an even more granular basis. Our idea was there, our theory was solid and now we had the visualisation to show it off. But we were just one team out of twelve presenting. As the presentations started, we knew we were up against some seriously talented and each team really delivered. 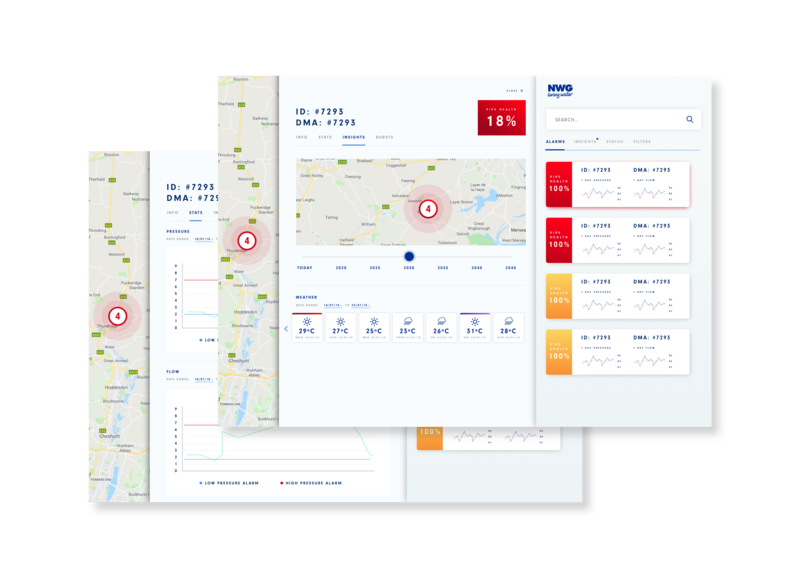 Our plan of attack was to present our app interface and explain how our Machine learning would fit into this model, greatly enhancing the organisation of an operations manager and their workforce. With only 4 minutes to present. Simon kicked off the presentation and introducing our expertise, then it was over to Paul and Josh to explain how our knowledge lead us to this journey and how we came to our theory. The last leg was down to me, I was to present the journey the user would go on with the app and how each piece had been thought out with the JTBD framework in mind. Adrenaline rush over, we sat down knowing we’d done all we could do. It was over to the judges and the teams to vote. 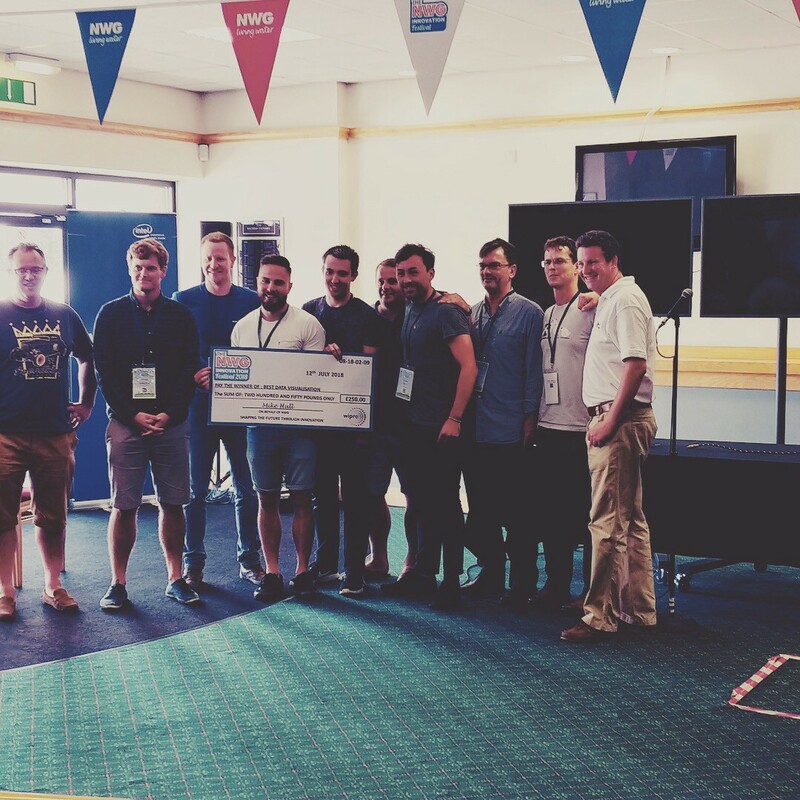 There were a possible 3 awards up for grabs, Best visualisation, Best insight, and Best overall solution. The votes are in. Could the teams gather round! After pinching ourselves, we stood up for our winners photo and to receive the check, we’re were humbled that the other teams and judges appreciated our designs. We were obviously delighted to of won award and the money that went with it, but for our team it was always about collaboration and helping to find a solution for the industry. What did we learn and what’s next? Always use the combined knowledge available to you. Data can be useless or Data can be all powerful. Data is completely what you make of it. At first we were overwhelmed by where to start. But by using the JTBD framework and our UX knowledge, we were able to take a step back, realise our strengths and narrow down what would be the most useful outcome. We have been incredibly fortunate and have had a lot of interest from the event and our team is continuing to work out how we can help other companies solve their business problems. If you would like to know how we could help you or your organisation then simply let us know..